Nominations for the 2019 Catholic Citizenship Awards are now closed. All schools that submitted an online nomination will have received confirmation of their participation. Details of how to apply for the 2020 Catholic Citizenship Awards will be circulated by email to Headteachers, R.E. Co-coordinators, Heads of R.E. and School Chaplains by the end of February 2020. If your school has not received notification of how to apply by this time, please email citawards@dioceseofbrentwood.org to request the link to the online application. 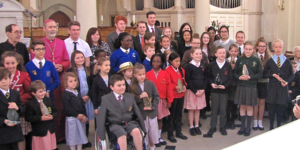 On May 23rd 2002, Catholic schools were invited to nominate and present pupils who had displayed outstanding awareness of good citizenship, to be presented by Professor Lord Alton with an award in St Helen’s Cathedral Brentwood. This was an initiative inspired by Professor Lord Alton, a former pupil of this Diocese, and supported strongly by the Brentwood Religious Education Service to encourage schools to respond to Government requirements that Citizenship be included in the curriculum. Brentwood Diocese is committed, as is Professor Lord Alton, to the idea that to be a good Catholic involves being a good citizen, ‘the Gospel of Jesus Christ requires us to “love our neighbour as ourselves” and that is at the heart of the Christian interpretation of citizenship’. Although the initial celebration involved only 11 of the 98 schools in the Diocese, in 2016 69 schools participated in this event. 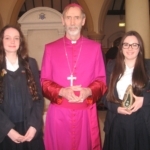 Pupils receiving the awards were the highpoints and embodiment of what their schools teach and stand for and, are examples of what all our Catholic schools are striving to achieve. It is important to state that our Catholic view of citizenship is a willingness to act for, speak for and serve the needs of those who, on their own, cannot do it for themselves. In a word, Catholic citizenship is service.